Unbiased praise and criticism straight from the press. La custom trifin 86 est la meilleure planche sur laquelle il m’a été donné de naviguer depuis longtemps . Dans l’esprit de la sphère Quattro . Flotteur équilibré à l’arret comme en navigation . Une merveille de polyvalence permettant de naviguer tant à Hookipa qu’à El Medano , à Sprecksville ou en Bretagne . J’en suis l’heureux propriétaire depuis un an . Sur les conseils de Mateo Cano j’ai complété la 86 par la 99 L’ensemble est idéal . Taille de voile de 5,3 à 4,2 pour 84kg . Merci à Keith Teboul et Francisco Goya de fabriquer d’aussi bons flotteurs et à Lalo et Mateo de nous les distribuer en Europe . J ai fait une sortie avec goya thruster 86l par 30 noeuds. La planche est vraiment rapide, plus que Goya one 86l. Les sensations sont seines, sauf on peut se faire surprendre au démarrage par l avant qui plonge. En fait avec 85kg je me dis que j aurais mieux fait de prendre 92l pour pouvoir aussi utiliser 5.5 m2. S il y a un volontaire pour un échange me contacter au 06 61 38 12 30. Love your new ad for the Goya Surfwave thruster made for lakes! !Yes it is! Love it! Francisco@ Team the Surfwaves Thruster 92 just is so much fun on Lake Erie from onshore to side offshore epic days some times in the same day to bump@ jump in the bay the board rocks!just plug@play fun 4.0 to 5.3! The new Custom Thruster is a dream (not only) for european waveconditions and even on the Lake it performs very well for sails up to 5.3 (using the QT 86). The board is a little bit flater then the Quads, planes earlier and jumps higher due to more possible power on the backfoot (for jumping). Also it´s very variable, for waves and strong winds you go with the standard 19cm Centerfin, for lighter winds change to a 21 or 22cm centerfin and you´re way earlier planing. And it is still a super waveboard for big waves, just a different style to Quads, I love that board! Cambie mi ONE 85 por la nueva CUSTOM T 86 2018 . Me parecio increible como se comporta la tabla , es muy ágil y liviana, la use con 4.0 y 5.3 es el mejor producto , fácil de doblar y muy buen planeo. 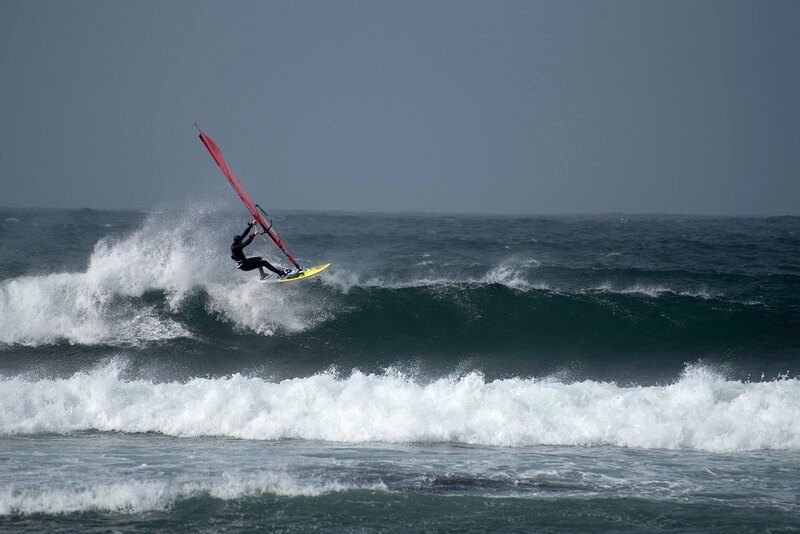 I sailed with the Thruster 92 and 4,7 in pozo this summer and is the first time I felt a 92 Ltrs board smaller than his size and so adequate to my weight 85 Is great because gets planning fast with great speed but the best is that it turns so well that I never yearned the quad . I have ordered the 92 and 86 sizes better for the conditions here in Mallorca. Congratulations for the shaper. Hi guys, just wanted to take a second to give feedback on the new gear I've ridden: Custom Quad 89 was mindblowing, I've never ridden anything in the 90 liter range that felt close as good as this, no freewave feeling at all, full on turny, loved it both on one stormy and one light day (fins all forward, straps all the way apart, base plate showing 1cm of mast track channel behind), Banzai 4.5 was extra nice, felt better than previous Banzais, even better than Fringe in those conditions, and this comes from a guy who loves the Fringe, winner sail (downhauled to dot, outhaul rather loose), Just to share. I had the chance to ride my 74 custom quad as a twin, but to be honest I can not find a real advantage.The 4 fins deliver more than enough speed and loosiness for my level and conditions. Obviously at Goya everything has been sorted out. As a matter of fact the MFC fins are fast and I start to like them more. I also moved the track as you guys said back 1 cm and my front straps one position back(I have one more to go). My back strap is also next to the last position . Btw MFC straps are great- light,stiff and comfy. The board instantly changed manners- the nose became more loose which compensates for the less nose rocker. This board is so much fun. I can't get enough of those backside hacks.. Unfortunately no wind in the foreseeable future. Snowing but still windy on the East Coast. I got this costum Ouad 80 -17 board and i have carving waves here in Sweden a feew weeks . This board is superb. I feel the board invites me too try harder. It feels amasing riding when im doing frontfoot turns in cutbacks and bottom turn. You could put enormus pressure turning in the bottom, the board doesnt give up. Ive been riding small sinking board for 30 years an now it feels like history. I have been sailing 3.5 and 4.5 the board kicks starts very early planing. so i feel i could ouse a smaller sail on this board. Full Power 3.5 today 3m Waves...I Love it. I've sailed the ultimate board for one year and are super happy with the capabilities of this board. GOYA Custom 86L from 2016 is faster and I get better control in the bottom turn. I've had Goya Custom Wave boards the past seven years and are always amazed what Francisco and KT come up with. I have been sailing my Custom Quad 106 for a few weeks now, in conditions varying from reasonably clean waves (3m swell) down to flat water, with 4.7m to 6.2m wave sails, all in Western Australia. After owning numerous wave boards in various fin configurations, I feel like I've found the one I'll stick with. Where my previous wave boards have all presented a compromise (slow to plane / hard to point upwind but good on a wave face, quick to plane but harsh in chop etc), the Custom Quad seems to perform with very little compromise. Planes early and easily, heads up wind well, smooth in chop, jumps well... And the way it carves up a wave face is so exhilarating - fast and precise, it caught me out the first couple of bottom turns but once I got used to the grip and speed I was hooked. The Goya Custom Quad 106 is a strong contender for a one-board quiver for me with my 91kg weight and decent (competent but nothing special) wave sailing skills. It's easy to sail but I can sense there's endless performance there that I can grow into. Durante la mia recente trasfertina a Pozo Izquierdo, Gran Canaria , ho avuto modo di utilizzare le tavole Goya Custom Quad 2016; ho pensato quindi di raccontarvi come è andata, con il solito stile della chiacchierata informale tra amici, nessuna velleità tecnica ;-). Io ho usato due volumi l’86 ed il 96 , ammetto che inizialmente ero un po’ contrariato da questo salto, non conoscevo lo spot ed il vento non era poi così forte, in virtù del mio peso avrei preso un 90-92 lt al massimo; 86 mi sembravano pochi e 96 tremendamente troppi… Seguendo i consigli dello staff sono uscito prima con il 96, per prendere confidenza con spot e attrezzatura, poi nel primo pomeriggio con l’aumentare del vento sono passato all’87 ; il secondo giorno invece, visto che il vento era più leggero e le previsioni lo annunciavano in calo, ho tenuto il 96 tutto il giorno; vele 4.7 il primo giorno , 5.0 il secondo. Iniziamo subito con il dire che le tavole sono molto simili, differiscono soprattutto per la galleggiabilità, ma il comportamento in acqua è pressapoco lo stesso. Mi sento però di affermare che se l’86 è una gran bella tavola, il 96 è strepitoso… mi spiego meglio: io di trovarmi bene in mare, in condizioni di vento e onda con una tavola quad ( adoro questo assetto) che ha qlc litro in meno del mio peso me lo aspetto, quasi lo pretendo da una tavola “del 2016 ” ( nel senso da una tavola dei giorni nostri) . Mentre di trovarmi forse anche meglio, con uno zatterone di 96 litri proprio non me lo aspettavo, il 96 surfa come una tavola di 10 litri in meno, nei miei miseri e bassissimi salti rimane controllabile, e offre quel surplus di galleggiabilità e sicurezza che mettono sereni in spot rognosi, difficili e che magari non conosciamo ancora. super super super i have my best board ever!!! 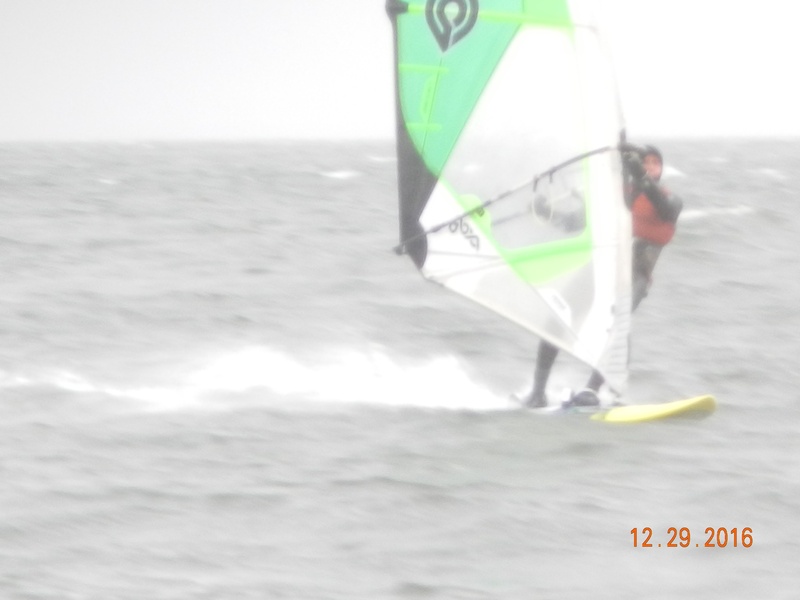 The custom quad 68 is the most fun board I,ve owned in 35 years of windsurfing!used it the first time during Gale Force conditions on the eastern Great Lakes!3.4@3.0 sails 2.5m waves love from the first reach out thru the shore break !quick to plane turns unreal goes upwind like a bandit!can,t wait to use 2.7 on it?highly recommended to light weights or women!thank you Francisco! I just bought The Goya One in Tarifa and I couldn't be happier after two days in the water. Conditions were extreme, with wind gusts approaching 60 knots. I was saling 3.3m sail and my 85L board, and my weight is 85 kilos. I was impressed how it responded in the water, where it seemed I was sailing a 78L. It was glued to the water when needed, but takes off like a feather when jumping. Amazing speed and amazing behaviour in chopi! Probably the best board I've ridden over the last years! Thank you Francisco, Lalo and team for the great work! 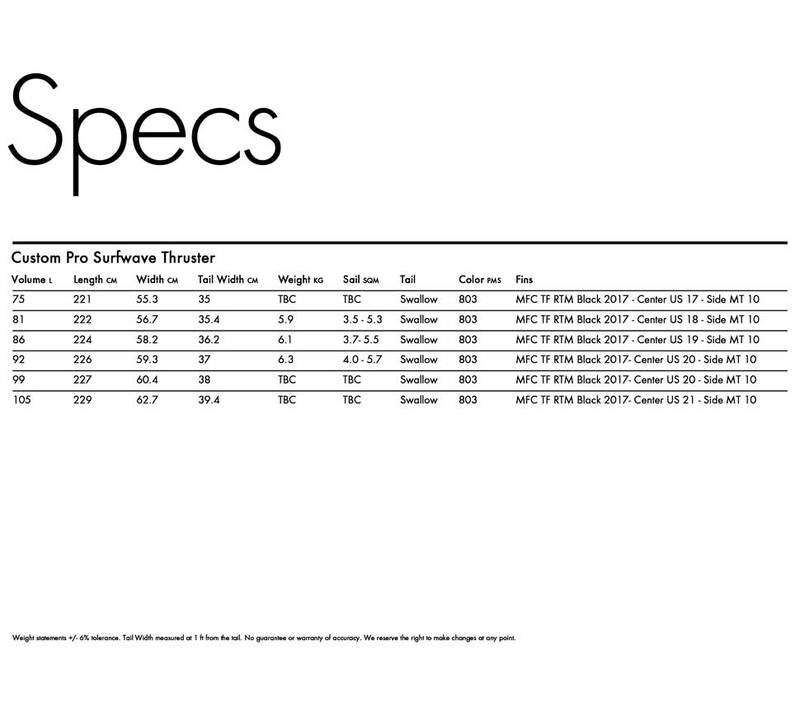 I have just bought a a Custom 80, which will be my unique gear for strong wind (sails 3.4 to 4.7). I will enjoy my brand new toy in Tarifa, mostly with side-off gusty strong choppy Levante (east) conditions. I tried the 80 and the 86. Due to my weight (72-76 kg) I opted for the 80, but I was extremely impressed with the 86 performance in strong (30-50 knots) conditions. I have to congratulate the shaper as I truly think this is a real change (and not marketing oriented) in R&D. That explains why all my friends (Paco 74&86, Rich 86, Ingo 74 and Ruben 86) are happy Goya customers now. No review here but would be fine to hear about the 68` .. someone has feedback ? at wich weight and wind should it be the best option ? I got out on your 80 Liter Custom Quad and a 4.2 Banzai at the Wall. What a fantastic setup I LOOOOOVE that board. I can't get over how well it turns while remaining super FAST! It was great in the air too! Excellent work! Wow amazing board, nice to be wave sailing with lower winds. Got myself the Custom 106, suprised about the small fins but they work ????! 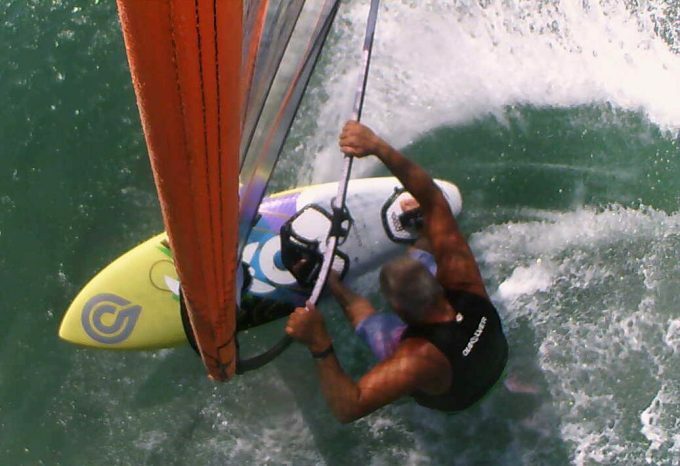 Goya 80 quad: the best wave board I ever had in 30 years of windsurfing. feedback from the board. It takes allways a big smile in my face if i ride the Quad at home Lake Brombachsee, easy planning, good in chops or in Sardinien where the rails are dreamly. Lay down was for me a very new big feeling. We wish you and your family a peaceful Merry Christmas and a Happy New Year. was in Maui for a couple weeks. First couple days were crazy windy and I used the 2015 Custom 78 and it was fun. But for the rest of my vacation, I was lucky enough to get a brand new Custom 86. It felt great. Very easy to ride and controllable. First couple times I had to get used to the back strap being so far back but quickly got used to it. The board planed early, was very controllable and felt great for jumping. But the standout was the grip in the turns. Hope you guys are well? Since I got the 2016 gear in September I had the chance to sail the boards and every sail size here in the Gorge and Ocean conditions. And I have to say I'm stoked. Plus I got lots of attention at the beaches from many guys seeing the Goya gear and asking lots of questions! Love the Fringe. These sails cover just perfect my needs. Having Jason close by is great as well so we can exchange feedbacks anytime if needed. The boards (have the Custom Quad 74 & 80 at this point) are very close to the customs I sailed. They work super for me at the coast and at the Gorge. Quick on planing feel direct with plenty of grip through the turns and at the same time loose enough for sliding maneuvers. First I was a bit concerned because the lower tail rocker compared to the boards I was used to sail. But I have to say I'm positive surprised how good they feel. 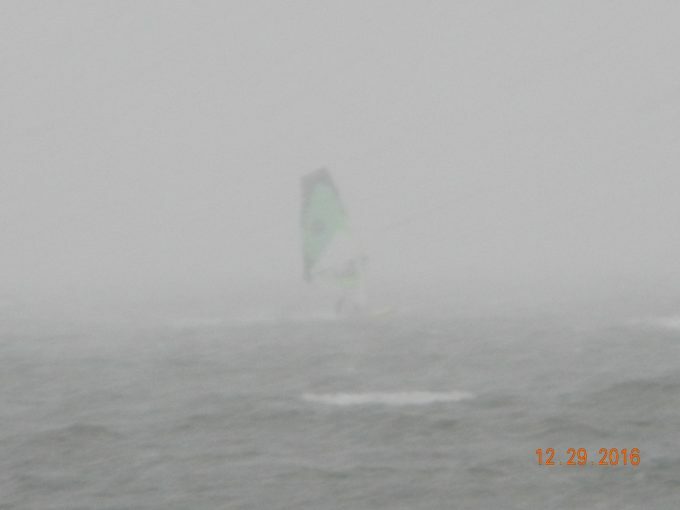 For me a perfect compromise between Ocean conditions and more choppy sailing here at the Gorge. Great job guys! This month i has been sailing with the Quad 96 and the 86 in Side on conditions . Give please my congratulations to the shaper of this boards , i think is Keith . I like boards with a good performance going onto plane and good speed but with control and good turning in the bottom. This boards are fantastic in all the points the two are lively . For me are the perfect boards for here Mallorca Island. I don´t know how you can improve the board. The 96 used with 5,4 and 5.0 are great .Today the 86 has sailed with 4.5 A friend of mine and me think that the 86 have less volume than the indicated . Is possible ?. The 96 with less wind and 5,4 is used with twin configuration on 17,5 cm..
have you great wind and waves. You know what i think of the 106 🙂 just multiple that by 1000 for the 86. Pretty much straight out da box I "added water" as you txt-Ed and the very first wave I score with it was logo+. 🙂 The board is butter, turns so hard, fast and easy. Slicing and dicing is back! Great acceleration in a straight line, and out of a turn, easy to float in underpowered conditions. Short length not a problem, instead big bonus as the board is more responsive and agile. Together with the fringe the new gear has never put a bigger smile on my face. It already starts when I open my van and pull my gear out: regardless of the conditions I know my session will be good. 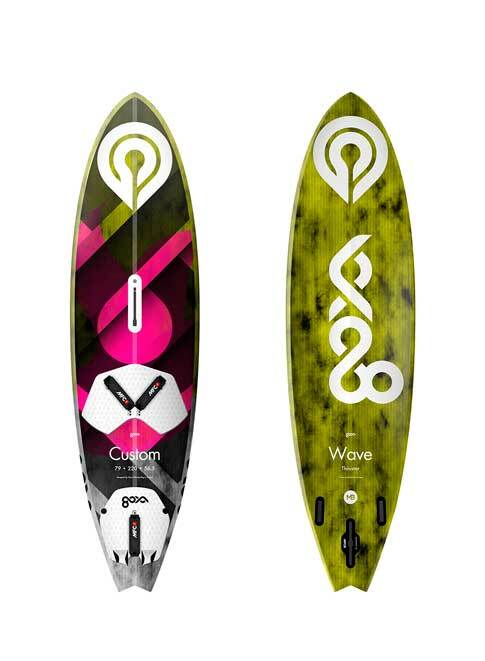 I've used Goya Custuom 80 2016 in Mauritius august/september 2015, from side to side off conditions, full power waves, strong wind and light wind the board is great!!! Super surfing more big waves more better. I use it winth smaller fins 25 cm. You can do a lot of bottom turn with this board in mode auto pilot. Is a radikal board but very easy to use. What impressed me is that you can yuse it also in Oneye where the waves are super fast and the wind is side/side off. I've used this board also in total onshore conditions and strong wind from 35 to 45 konts, well the boards is ok, you can surfing onshore and fly high wih yours jumps. Just to let you know, I'm riding the production board 86 again here in France and felt super fun . The wind was dead onshore and i was super stoked with the board on the backside carvs and hits on the white water . feels safe and secure hitting the lip and also releases tail very well . Al least i could sail with my 96 . The season was perfect and the board surprised because is like you are riding a 85ltrs board . I sail with a 5.4 that will be the max size i will put on it because i have bought the board for more wind. Hi Guys, just to let you know I have had 6 sessions on the new 106 and its ace! This board makes me smile and I cannot get enough of it. Its on loan from the shop but its not going back! Here is a pic from yesterday . Heading down the line to the Steelworks in South Wales. Thanks for making great boards for us bigger guys. Yep, all is very well. I finally had an awesome session on my new Goya Custom 106 at waddell on Sunday: logo+ west swell and perfect wind for 5.3 Fringe (I am borrowing Rich' sails now since I have already sold all my sails, expecting to have the new once by now... more about that later). I'd already used the 106 a few times at 3rd Ave in the channel for B&J gorge style conditions in some nice rollers, where it works fantastic btw. But, I wanted of course to get my hands dirty on some solid waves. And Sunday, finally, presented those conditions. It took me a few waves to get used to the quad feeling again, after having been on thrusters for almost 2yrs now, but this board is some mean machine. The harder you push the better it works. It wants to be railed, kicked, throttled. Don't be shy with it. Once I got it dialed in, it was balls to the walls. Or as some told me later "you got some super nice hits!". 🙂 What I like about the board is that it's so predictable. It really has that Francisco feeling in it; butter smooth, grace, controlled, but powerful. The short length was getting used to as one needs to be further back on the board or it will nose dive. But, it planes up early enough, great speed, amazing control and carves so easy. Floats well, as long as you're back. Great wind range; 4.7 not a problem. What really surprises me is that it absolutely never feels like a 106. Especially not in big waves or OP-ed. It always feels much smaller. IMHO this is probably the easiest, turniest, smoothest, powerful, best looking 100+ liter wave board I've ever had. I am so stoked to be back on the quad as it allows IMHO my style (as some call me the "slicer and dicer") more so than a Thruster. I can't wait for the 86. The graphics are fantastic, but IMHO the board can be sanded down to save additional weight. That's the only "negative" I have.